On behalf of the JOBFS team we would like to thank everybody who has downloaded their free copy of the JOBFS year book We have had nearly 550 downloads. 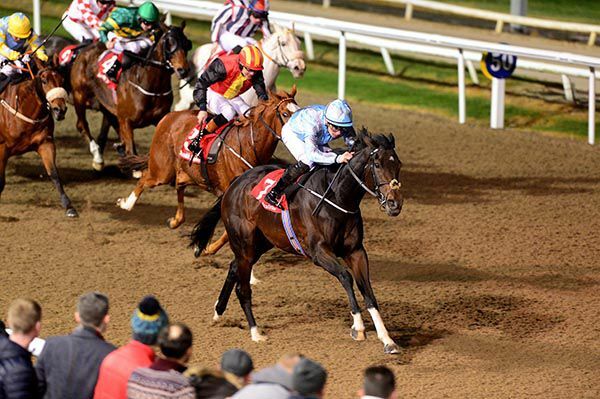 Shadow Seven (5/2 into 2/1 favourite) followed up on his course win from nine days earlier to round off a great day for trainer Joseph O'Brien in the concluding Dundalk Stadium - Light Up Your Night Handicap. Joining his stable companions Aforementioned, Scarlet And Dove (Limerick), King's Vow and Too Precious on the winner's podium, Shadow Seven, in the hands of Alan Persse, got home by half a length from Every Beath. “He won well over a mile-and-a-half the last day and the plan was to make plenty of use of him but he was a bit slow away,” said Persse. “To be fair to him he ground it out well. He did it well in the end. 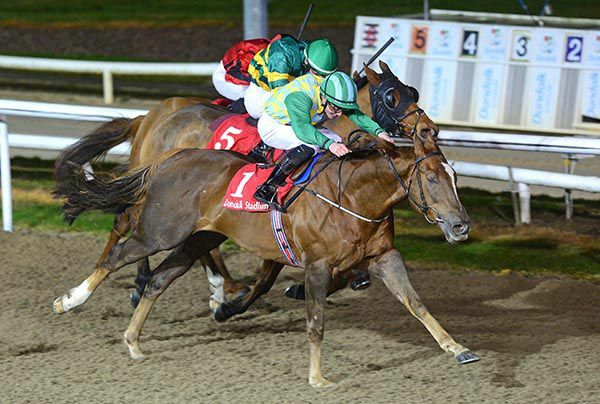 Four on the day for her trainer, four on the spin at the course for the horse, and a double on the card for her rider, that's the story to go with Too Precious' win in the Irishinjuredjockeys.com Handicap at Dundalk. Niall McCullagh won on Paul Flynn's Lunastar earlier, and here he was aboard Joseph O'Brien's Too Precious (11/4 favourite), up in trip to this mile and a half distance for her latest assignment. Following on from stable companions Aforementioned, Scarlet And Dove (Limerick) and King's Vow (Kevin Manning in the opener on this card), Too Precious toughed it out well by three parts of a length from Dawn Trouper. “She obviously loves it up here and she's improving,” said O'Brien. “Today was a big step up because she didn't have the claim and she was up in class. I personally thought she'd struggle. “Niall gave her a great ride and saved all the ground. She's progressing away obviously. “Eventually we could look at black-type but she won't get a shot at that until next year. “We'll find another race up here and go from there. She obviously has a real liking for the place. 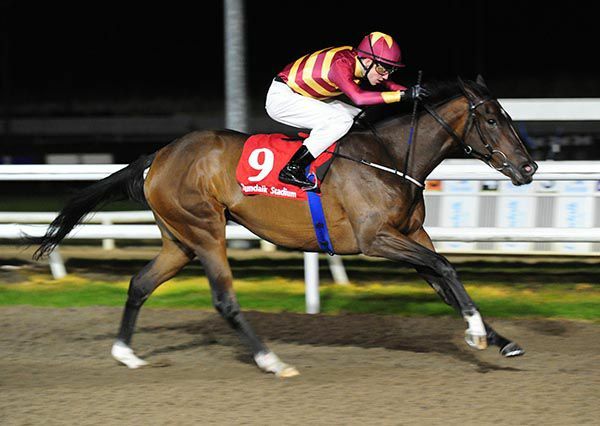 Kevin Manning rode his first winner for Joseph O'Brien when King's Vow (7/2) added to the earlier gains of his stable companions Aforementioned and Scarlet And Dove at Limerick, in the Irishinjuredjockeys.com Nursery Handicap at Dundalk. Early Strike led in the middle of the track from two furlongs out, but he soon began wandering about and the triumphant 66-rated son of Frankel took over from a furlong out. King's Vow wasn't long about putting his stamp on proceedings, going on for a three length verdict over Joza. “He had a good run here the last day,” said O'Brien. "He seems to be slowly away from the gates for some reason. He's a slow learner but he's getting there and the blinkers have been a help to him. It was nice to see him win today. 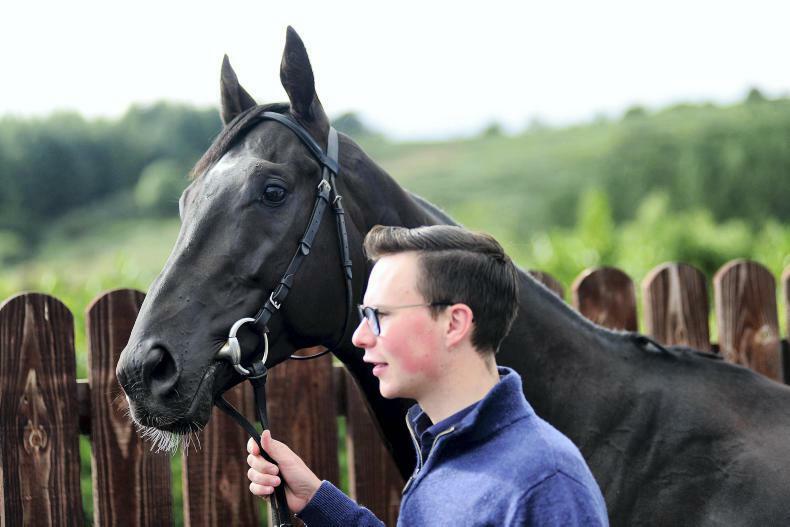 “I thought he was just green on his first couple of runs but I'd say he's just a little bit lazy and probably wants to go ten furlongs eventually. “I'd guess he'll come back here again and then he'll go to the grass. He galloped out to the line well and I'd say he's probably learning. Jeremy filly Scarlet And Dove made an impressive winning debut in the mares' bumper for lady riders in Limerick. The four-year-old made headway into third entering the home straight and tanked between horses to pick up the lead over a furlong out. She was soon asked to go about her business by Laura Hourigan and drew a good six and a half lengths clear before being eased close home. She was backed in from 6/1 to 4/1 and beat 7/2 joint favourite Dolly Dancer into second. Gotthenod was 12 lengths away in third at 25/1. Laura Hourigan said: "She quickened and did everything you'd want her to do on her first run and there weren't bad horses in the race either. Joseph (O'Brien) told me to keep a hold of her and get her home and if it pays off it pays off. "It's my first ride in those colours and it's my first ride for Joseph as well; it's nice to get and hopefully it's the first of many!" This brought up a double for Joseph O'Brien and Gigginstown who earlier scored with Aforementioned. 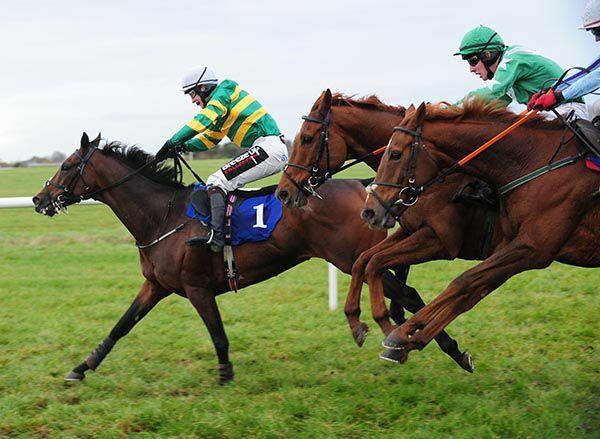 Aforementioned proved too strong for Free Ranger at the business end of the two mile maiden hurdle in Limerick. Evan Daly's mount tacked onto Free Ranger sweeping the home turn and the pair drew clear by the second-last. Aforementioned got on terms at that flight and was soon pushed along to take over a length out of Free Ranger approaching the last. He popped that one well and won going away by five and a half lengths to justify 6/5 favouritism for Joseph O'Brien and Gigginstown. Free Ranger was beaten five and a half lengths into second with Ilikedwayurthinkin another three lengths adrift in third at 10/1. 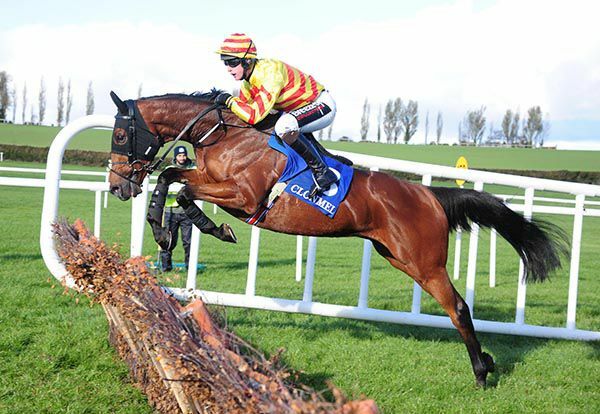 Evan Daly said: "He did it well and was entitled to do that on his first run over hurdles at Navan last season when he finished third in a decent maiden hurdle. "He should come on plenty as he is still a raw horse. He should get better in time and with more experience as well." 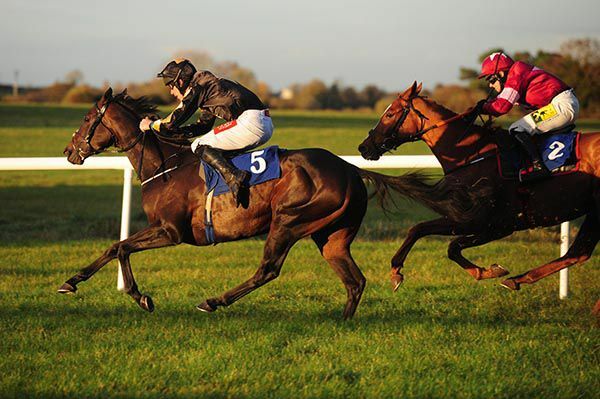 Joseph O’Brien is firing on all cylinders under both codes at present and he sends out a strong dual challenge in the featured irishinjuredjockeys.com Handicap at Dundalk this evening. Too Precious has progressed rapidly on the Polytrack in recent weeks to complete a hat-trick over the extended 10 furlongs, and now steps up to a mile and a half. The daughter of Holy Roman Emperor has finished strongly on each occasion so there is every chance that she will cope well with this longer distance. However, her handicap mark has risen sharply as a result of those victories, from 58 to 83, and it is interesting that regular partner Shane Crosse now switches to stable companion Perfect Tapatino. The four-year-old has also won three times for the Piltown trainer this term, with the latest of those gained over this trip at Leopardstown. Perhaps the combination of an extra quarter-mile and some cut in the ground proved too much at Naas last time. 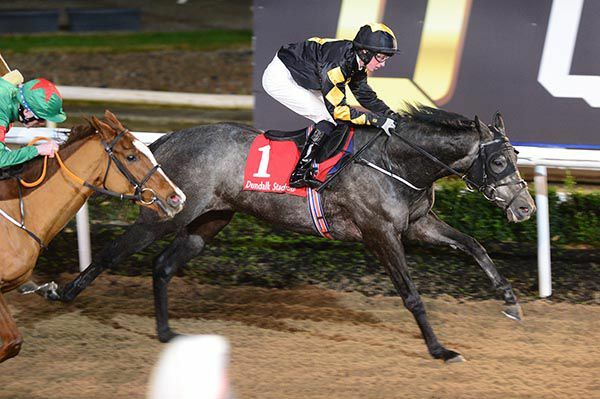 O’Brien has prospects elsewhere on the card with King’s Vow in the opening irishinjuredjockeys.com Nursery, while recent course winner Shadow Seven is another to note in the concluding Dunbdalk Stadium — Light Up Your Night Handicap. Joseph has 10 new horses Darasso, Majurca, Eklat De Rire, Top Moon, Melay, Konitho, Fakir D'oudairies, Filon D'oudairies, Fine Brunello, Front View and a 2 year old filly has just been named Simple Words. Christopher Robin has been gelded. 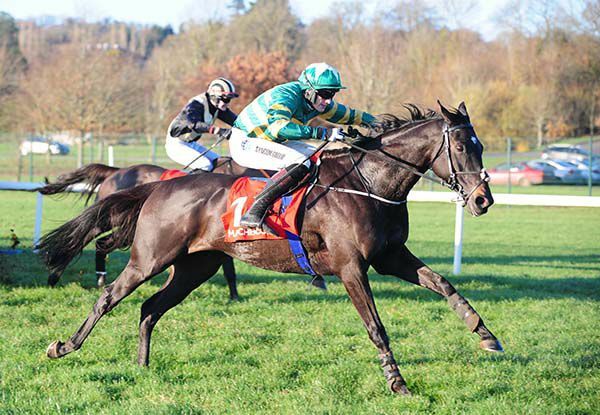 The Moyglass Flyer overcame greenness and a number of mistakes to make a successful debut in the Cahir Maiden Hurdle at Thurles. The well-bred son of Galileo was headed by 6/5 favourite Eclair De Beaufeu after meeting the second last wrong but responded to Mark Walsh’s urgings to get back in front before the last with Exceeded Brief also challenging on the outer. The Joseph O’Brien-trained 6/1 chance again relinquished the lead when stumbling badly on landing at the last. However he found plenty when asked on the run-in and got back up in the final strides to pip Exceeded Brief by a neck. Eclair De Beaufeu could only keep on at one pace a further half-length back in third. Walsh said, “He’s very green and wasn’t doing a lot in front. We didn’t go much of a gallop so I had to send him on which wasn’t ideal but he’s won in the end which is the main thing. “He battled back well. It’s his first run ever so all you can hope if he’ll improve from it. Inca Gold led home a one-two for Joseph O'Brien in the novice hurdle at Gowran Park and gave the trainer a double on the card. The Galileo gelding was making his debut over flights after a career on the Flat for Aidan O'Brien that yielded one runner-up spot from three appearances. He may have a been a 25/1 outsider but he was always to the fore in this two mile contest with JJ Slevin in the plate. He jumped the last particularly well and landed full of running. Stablemate Entoucas (9/2) stayed on in second but Inca Gold showed a willing attitude to beat him by a length. Satoshi was another length and three parts away in third at 9/1. Joseph O’Brien said: “He’d a few runs on the Flat but it was his first run over hurdles. He’s always jumped well and he’s bowled along there and they haven’t come and got him. "JJ gave him a great ride and he’s a hardy horse. JJ Slevin added: "He's a good, hardy horse over hurdles and he was good and brave and good and honest. "His Flat form was actually fairly strong. He's good and straightforward and an uncomplicated horse. They weren't going a lot of pace so we were more than happy to go. "He had been off the track a good while but Joseph had plenty of work into him at home and he was good and fit coming here but I'm sure he will come on from it." O'Brien took the preceding race on the card with Ballyneety. 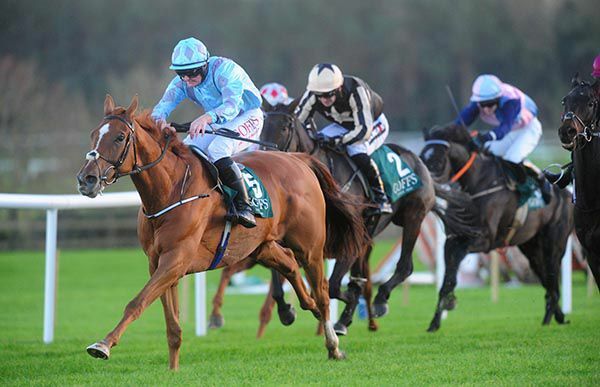 Ballyneety took full advantage of a mistake at the last by Calicojack to land the two mile maiden hurdle at Gowran Park. Mark Walsh's mount came home best to wear down Calicojack on the run-in and score by half a length at 2/1. Calicojack had to settle for second at 10/1 with Myth Buster the same distance away in third at 25/1 (from as big as 80/1 in the morning). Trainer Joseph O’Brien said: “It’s his first run over hurdles and only his second ever run so I’d imagine he’ll learn a lot from today. Mark was very happy with him and said he’d come on from the run. O'Brien has had 18 winners in Ireland, between the flat and jumps, over the last three weeks. 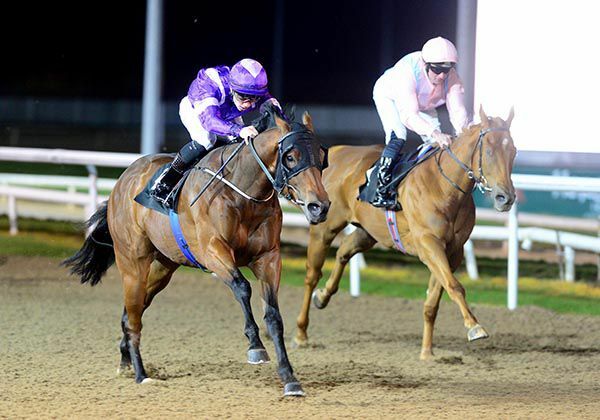 Following on from the win of Too Precious earlier Joseph O'Brien and Shane Crosse doubled their score with Equitant (5/4 favourite) in the Floodlit Friday Nights At Dundalk Stadium Apprentice Handicap. Making it two from two for current connections, Equitant was made to work but he eventually got the job done by half a length and the same from Arbourfield and Reverberation. "He was very brave. I was there a bit too soon on him but to be fair to him he put his head down when they came to him and he battled well to the line," said Crosse. "He was the highest-rated horse coming into it and probably the form horse and he did what he wanted. "He has got a nice bit of racing done now so he knows where the winning line is too, you just need to keep him up to it. He's a lovely little horse." And on booting home 10 winners in the last five meetings here, he said: "You can't complain! It's all down to Joseph (O'Brien) and my agent Kevin O'Ryan. Please may it continue." 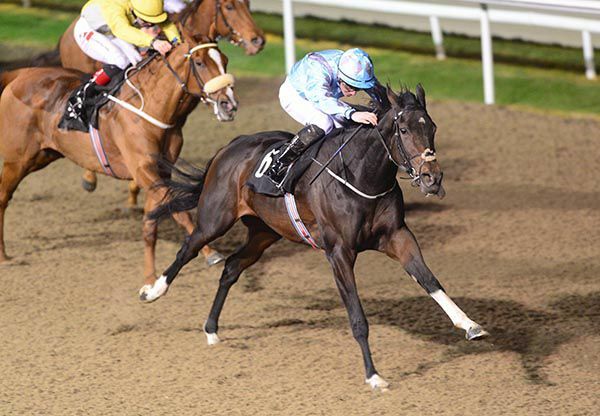 Too Precious (13/8 favourite) goes from strength to strength and her latest success came in the Fundraising Made Easy At Dundalk Handicap tonight. Again in the Annus Mirabilis Syndicate silks, Shane Crosse delivered her down the outer to beat Secret Wizard by two lengths. "She's just one of those types that just relishes Dundalk. To be fair to her this is her third win in a row up here and it was a great training performance," said Crosse on the Joseph O'Brien-trained winner. "I think it is a bit of half and half (the surface and a filly who is nicely handicapped and has hit form) and she really does like it up here. "She stays the trip very well and she has an extra gear to pull away so everything is perfect at the moment. "She could (step up in trip) but she has a load of boot so there might not be need for that." Rachael Blackmore got one over championship rival Paul Townend as Commandant justified good support in the Racecourse Bookmakers Handicap Hurdle at Thurles. The Joseph O’Brien-trained gelding was making his handicap debut and appeared to relish this quick surface after generally disappointing on testing ground. The Gigginstown-owned gelding was backed on track from 7/1 into 9/2, although Townend appeared to hold all the aces as top-weight Lleyton travelled well to challenge at the home turn. However he didn’t find as much as expected and Commandant made headway to lead just before the last. Blackmore’s mount met the flight on a perfect stride and soon settled the issue to beat Lleyton by four lengths, leaving her four behind Townend in the title race. O'Brien said, "He is a nice big, good looking horse in a low grade race and I'd say the better ground today suited him compared to what he had been running on previously. "Obviously he is getting older and is maturing and he'll jump a fence for sure. I guess he'll be better when he jumps a fence as he jumps well. He has a tendency to be keen and settled there today. That helped him finish out the race a bit and Rachael gave him a great ride. "He is in here again on Thursday and will probably come and will then probably jump a fence. Shadow Seven the four year old landed the Crowne Plaza Leading Jockey&Trainer Handicap (div 1) under Classic winning jockey Shane Foley. Foley, winner of this year's Irish 2,000 Guineas on Romanised, was himself notching winner number 64 since January 1 and later stated “he had a good run up here the last day over a mile-and-a-quarter and we went very slow, and he was a bit slow out of the gates. “He was a lot sharper today and I was able to get a position. Going a mile-and-a-half, and a nice pace, suited him. Joseph O’Brien’s Irish Derby hero Latrobe is set to try and put a perfect seal on the young trainer’s 2018 flat campaign at Hong Kong’s international carnival next month. O’Brien’s first classic winner as a trainer is being targeted at the Longines Hong Kong Vase over a mile and a half during the last major international Group One programme of the year on December 9th. Latrobe finished runner-up in the Mackinnon Stakes at Flemington in Australia earlier this month when running over a mile and a quarter. “He’s still in Australia and he’s being trained there for Hong Kong. He will be shipping out in the next week to ten days,” said O’Brien on Tuesday. “It will be for the mile and a half race [the Vase]. He ran a cracker the last day and got away with the trip but I think his best distance is a mile and a half. “He’s a good bit better off at the weights in Hong Kong than he was in Australia. He had to race off level weights with older horses there whereas in Hong Kong he gets five or six pounds. And he was giving Australian three year olds a stone and a bit,” he added. However the weight scale won’t allow O’Brien’s brother, Donnacha, resume the partnership on Latrobe that saw them secure a memorable Derby victory at the Curragh during the summer. That was another significant step on the meteoric rise to training fame by the former champion jockey who only officially took out a licence in June of 2016. Last month came another Group One success with Iridessa confirming herself a classic prospect for 2019 by landing the Fillies Mile at Newmarket. Last week O’Brien reached 100 flat winners for 2018 in Ireland. It has been a campaign that saw the 25-year-old finish runner-up (with €2.5 million in prize money here) to his father Aidan in Ireland’s trainers’ championship. 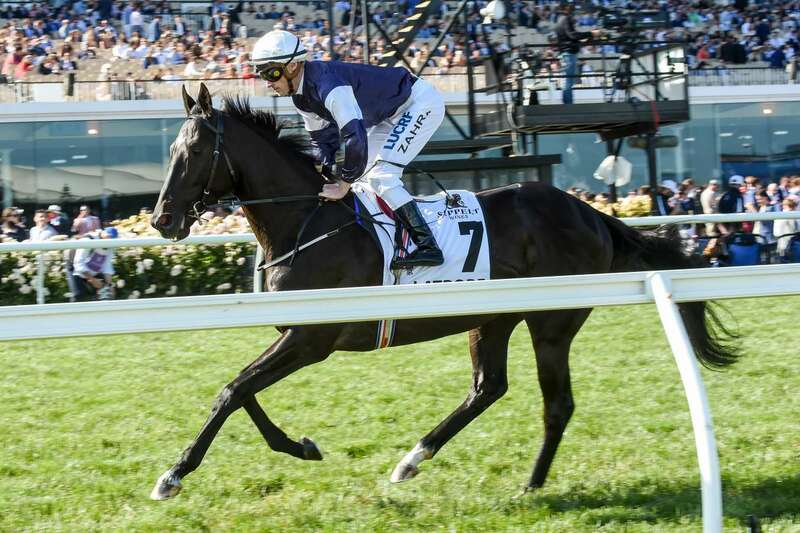 It has certainly continued the momentum of 2017’s stunning Melbourne Cup victory when Rekindling beat Johannes Vermeer at Flemington. O’Brien also had good news on Tuesday about the chances of he and Rekindling teaming up again in 2019. “Rekindling never came back after the Melbourne Cup. He stayed in Australia but got some kind of injury. It remains to be seen but I’m hopeful he can come back to me next season,” he said. 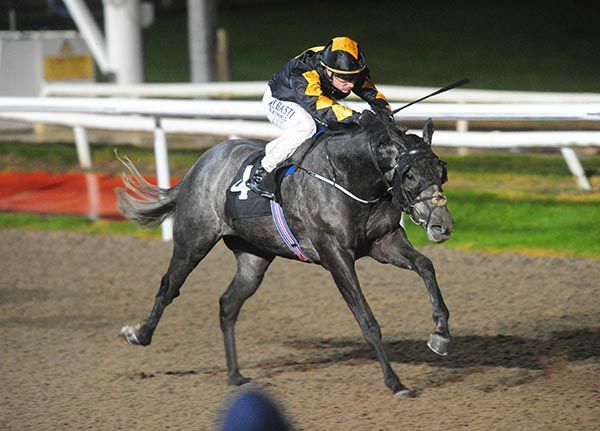 O’Brien is an odds-on favourite to win Dundalk’s winter championship series and will have three runners at the all-weather circuit on Wednesday night. However the scale of his dual-purpose operation is unmatched at the moment so, like many National Hunt trainers, O’Brien is anxiously keeping his fingers crossed for rain to ease ground conditions for some of his top jumpers. He is fifth in the National Hunt table already with 39 winners and is keen to get the wraps off some of his better jumpers such as last season’s Irish Gold Cup hero Edwulf. “The plan is to start Edwulf off in the John Durkan Chase. It’s obviously short of his optimum but he’s in great shape and we’d like to start him off there. “We have some nice novice hurdlers and chasers and I’ve a few entered at Gowran and Navan this weekend. But, like everyone else, we’re waiting on rain. “The plan is to go to the Drinmore[Novice Chase at Fairyhouse] with Le Richebourg and Rhinestone is in the Royal Bond [Novice Hurdle]. But he’s in a Grade Three over two and a half miles [Monksfield Novice Hurdle] at Navan on Sunday and we might look at that,” O’Brien said. A total of 15 entries remain in the Monksfield after Tuesday’s forfeit stage and they include last weekend’s 1-5 Punchestown winner Commander Of Fleet. 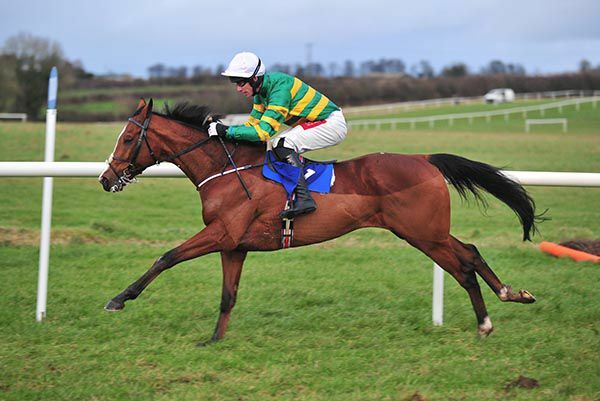 The unbeaten four year old is one of a handful of entries in the race owned by Michael O’Leary’s Gigginstown Stud. They also include the O’Brien-trained Choungaya. O’Brien’s recent impressive Thurles winner Silk And Sand is one of 17 still in contention for the Listed mares bumper on the Navan card. Proud And Elated tries to break her duck in the Dundalk maiden on Wednesday but she’s up against the 81 rated Modern Love. All The Answers ran out an easy winner of the Matchbook Betting Exchange Handicap Chase, scoring under Shane Shortall for Joseph O'Brien. Twice successful over flights in 2016, the son of Kayf Tara was second on his chasing debut at Killarney in July of last year, but disappointed on his four starts since. Making his debut in handicap company this afternoon, the bay victor opened on-course at 16/1, before going off a 12/1 chance in the colours of owner JP McManus. Settled in mid-division on the inner, he came with his effort from three out, and eased to the front before the last, keeping on well from there to score by five lengths. Tisamystery (20/1) finished second under Daniel Holden for Henry de Bromhead, while the well-backed favourite Blast Of Koeman (5s to 11/4 on-course) was a neck back in third. Damian Byrne, representing Joseph O'Brien, said: "Shane was very happy with him and we'll go for something similar after that. "He jumped really well for his first handicap and will obviously come on for it." bred by his trainer Joseph O'Brien's parents Aidan and Annmarie under their Whisperview Trading Ltd banner, Chead Solas (4s out to 13/2) came good on start two to land the Goffs (Pro/Am) INH Flat Race at Punchestown. With a tongue-strap added, after a Killarney second placing in August without that equipment, Chead Solas here got the better of Soldier At War by a length and three parts, with four lengths back to odds-on favourite Rebel Og (10/11 into 4/6) in third. Soldier At War had to be switched wide to deliver his run. “Tom gave him a good ride. He had a good run first time out and improved plenty from it. I'd say he's got a big engine,” said O'Brien. “He's a big horse, he's 16'2. 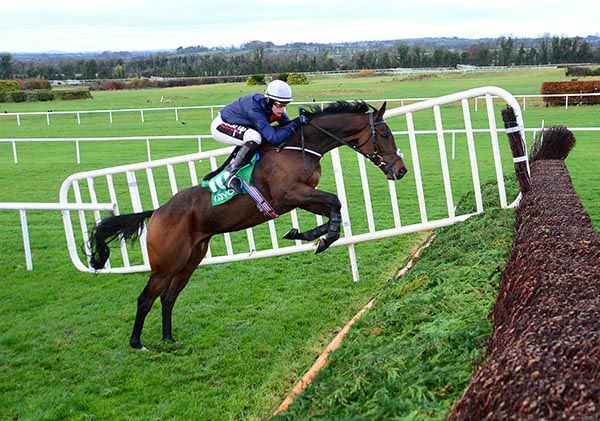 He'll probably stay in bumpers and go novice hurdling next year. 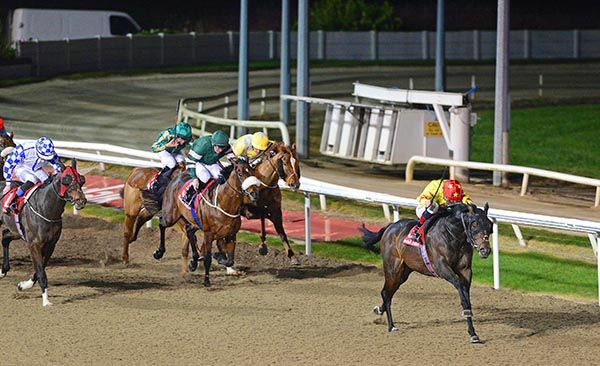 The market proved correct for the Floodlit Friday Nights Rated Race at Dundalk this evening as the Joseph O'Brien trained Equitant flip-flopped to favouritism ahead of stablemate Dramatise, before eventually winning under in-form jockey Shane Crosse. Dramatise, a winner on debut at Fairyhouse in September, was installed the 6/4 morning favourite but, returning from a 53-day break, drifted markedly all day to a SP of 11/4. Eventual winner Equitant on the other hand had won at Chelmsford just 22 days ago and, on his first start for O'Brien, shortened from 100/30 'early doors' to 2/1 first-show on track, before returning a heavily backed 6/4 favourite. In the race, Equitant raced prominently and eventually wore down leader Mr Ormsby in the closing stages to record a head win. Dramatise was never in contention and was well held in fifth. Damian Byrne, O'Brien's travelling head lad, later reported “he only arrived with us two weeks ago and was bought at the sales; Richard Fahey had him previously. Equitant was recouping some of his owner Nasir Askar's 80,000 guineas outlay at the recent Tattersalls Horses In Training Sale with today's E7,392 first prize while jockey Crosse was himself completing a double on the day to move to five winners clear of Conor Hoban (7-2) in the early stages of the Jockeys' Championship Winter Series. Latrobe and Rekindling Likely to return to Joseph for a 2019 campaign? Latrobe is entered into the Group 1 Longines Hong Kong Cup over 10 furlongs and also has an entry in the Group 1 Longines Hong Kong Vase over 12 furlongs. The final declarations are through on the 6th December. Stronghold and Master Of Reality have been gelded. The Joseph O'Brien-trained Thermistocles made a winning start in handicap company with a convincing success at Clonmel this afternoon. 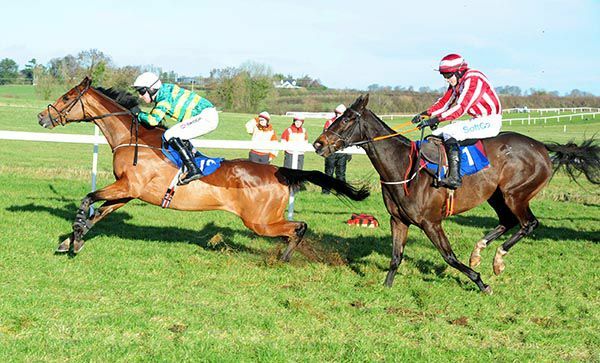 The Oscar gelding had been placed twice in maiden hurdles and stepped up to three miles for the first time in the Clonmel Oil Service Station Handicap Hurdle. JJ Slevin produced his mount to challenge before the second last and the 5/1 shot kicked on before the last. He galloped on strongly in the closing stages to post a four-and-a-half length winning margin over Odit. "He had a good run behind Dortmund Park last year and it was his first handicap run today and was a good bit of placing by Joseph and he did it well,” said Slevin afterwards. "The owner (his cousin Sarah O'Brien) is at work and Joseph is at home, he's busy and we're going schooling three year olds afterwards, so I'm running off to do that. "Joseph has been unbelievable to me and has given me a massive amount of support and Ken Whelan is a great agent." 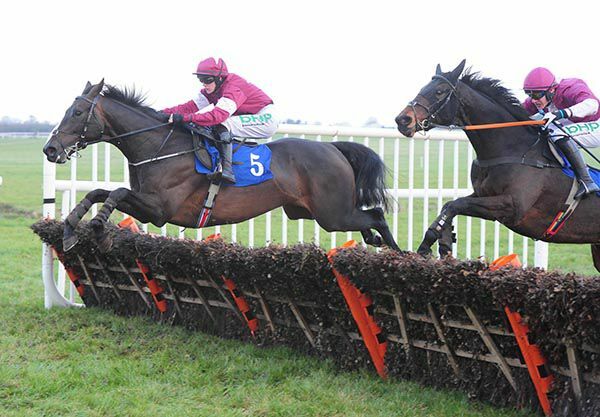 Us And Them was another horse to win from the front in Navan, this time in the beginners' chase. Joseph O'Brien's five-year-old gelding made virtually all but looked vulnerable to strong-travelling Duca De Thaix who tracked him going to the last. Us And Them put in a fantastic leap at the final fence, though, and quickly bounded clear to score by two lengths at 5/1. Duca De Thaix had to settle for second at 7/1 with Trainwreck six lengths further away in third at 6/1. The gambled on 5/2 favourite Jetz unseated Robbie Power at the third-last when racing third. Winning-jockey JJ Slevin said: "The run at Wexford would have brought him on fitness wise. 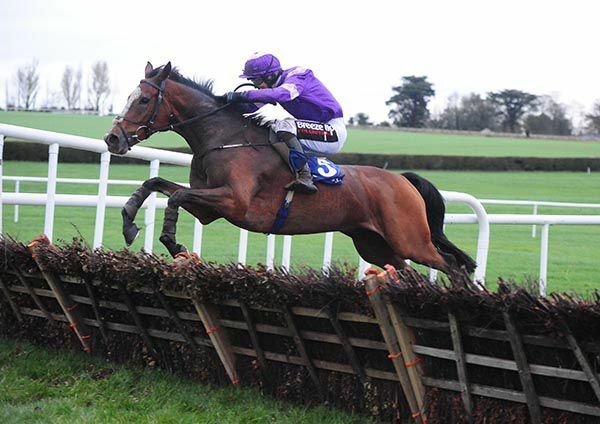 He jumped very well in Wexford and he jumped well again today and that probably won it for him. "He won two hurdles and was second in a Grade Two and he's 16.3 and a big fine horse. He could be a nice two-mile chaser. 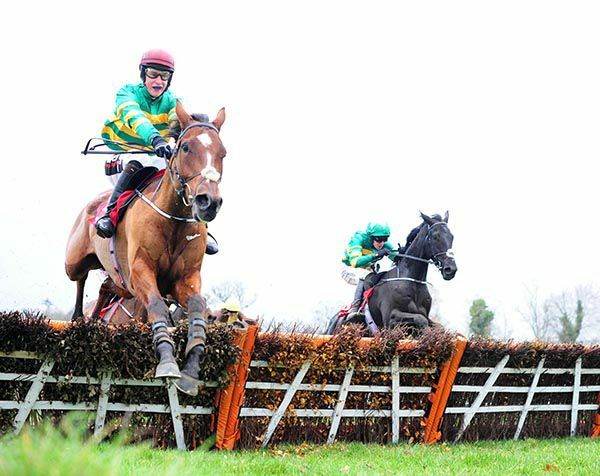 “He went around Punchestown as a four-year-old and he was always a great jumper. He did it well." Market movements beforehand weren’t the soundest guide with Rhinestone drifting from 1/2 to 8/13 and the same connections Anywayyoulookatit coming in from 33s to a starting price of 14s. The former got the job done all the way the same, in the Naas opener. This big field Irish Stallion Owners EBF Maiden Hurdle was marred by the early fatal injury sustained by French Furze. Up the straight Rhinestone and second favourite Envious Editor had a good duel but Mark Walsh on the winner always looked happy enough that he’d edge it, and that he did by a short head. They drew on by ten lengths from the third home, the pace-setting Good Luck Hope. Competing like Rhinestone for J P McManus and Joseph O’Brien, the aforementioned Anywayyoulookatit finished twelfth. McManus racing manager Frank Berry said: “Hopefully he’ll come on jumping wise, and he was quite good over the last two. They didn’t go mad and it ended up a bit of a sprint. It was a bit messy with the loose horse. Dundalk's Winter Series is in its infancy but already Champion Apprentice Jockey Shane Crosse has laid down a marker and completed a treble at the venue this evening in the concluding Crowne Plaza Race & Stay Handicap on the Joseph O'Brien trained Too Precious. Crosse partnered 11 winners in the month of October to help secure his Championship and today swiftly moved to the five winner mark for the new Winter Series, as today's treble was added to a double at Wednesday's curtain-raiser. Trainer O'Brien supplied Crosse's first winner today with Kiss For Luck before the 17 year old rider partnered Ahundrednotout to win for trainer Johnny Feane. Too Precious was then delivered with perfect timing to get up close home and defeat Rips Dream by half a length. Paddy Power bookmaker has already cut the 5lbs claimer to even-money favourite to win the Winter Series Jockeys Championship, from 2/1 yesterday, and following the finale, Crosse said “she got a nice position the whole way but it was a bit of a rough race most of the way. “I started to get her rolling early but I thought Conor Hoban's horse might have just gotten away and that I was going to do well to catch him. “To be fair to her she was game, she put her head down and put the race to bed. “She's only ran here three times and has never been out of the money and this could be a good place for her now. 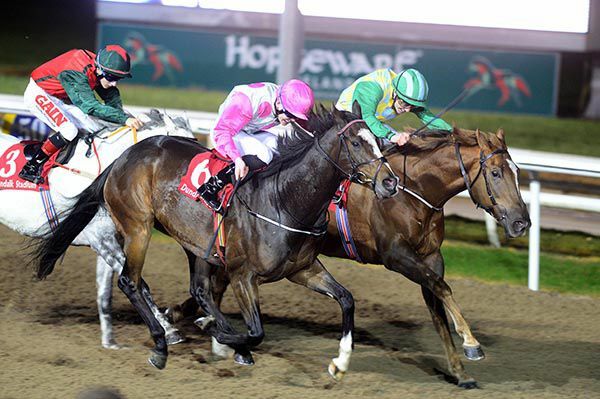 Kiss For Luck made a winning debut for trainer Joseph O'Brien at Dundalk tonight as the daughter of 1,000 Guineas winner Yesterday landed the opening Irish Stallion Farms EBF (Fillies) Maiden under Champion Apprentice Jockey Shane Crosse. The Scott Helder owned daughter of Zoffany made her debut when ninth in a Curragh maiden in May for previous trainer Michael O'Callaghan and today belied a 167 day absence when making all for a length win over Kalanoura. Crosse later said “I wanted to get a lead but she jumped very well and I just sat upsides in front with Joseph's other filly (unplaced Syrena). “We got it handy and she had enough experience to keep her going. She had a nice run in the Curragh on her first run and I'm delighted with that. “She'll come on loads from that and please god she'll step forward again. Kiss For Luck is the seventh foal out of Ballydoyle's 2003 Irish 1,000 Guineas winner Yesterday who, prior to today, had produced just two minor winners. Joseph O’Brien followed up a double at Dundalk yesterday evening with yet another brace this afternoon as Silk And Sand took the Toboradora INH Flat Race at Thurles. This bumper success was hot on the heels of the victory of Los Alamos in the previous 2m6f maiden hurdle. The Beat Hollow filly confirmed the promise of her debut third at Fairyhouse last month, and was patiently ridden here by Derek O’Connor. The 11/4 chance was produced with a confident challenge on the outer in the straight, and was just pushed out inside the final furlong for a cosy length and a half verdict over the odds-on Final List. 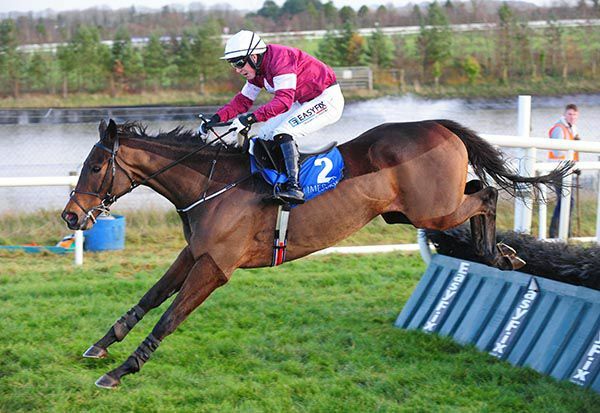 O'Connor said, "She improved a show since Fairyhouse and she is after winning quite readily. She was a little green in the straight and it turned into a dash. "She could keep improving now and could be a nice mare going forward. She is from a good family and she can add to the family and keep up the tradition." Los Alamos brought up a quick double for owner J P McManus when taking the Thurles.ie Maiden Hurdle. Bay Hill carried the famous green and gold colours to a narrow victory in the previous handicap hurdle and Los Alamos didn’t have too much to spare either in this 2m6f event. The Joseph O’Brien-trained gelding looked set for a convincing success when asserting after the penultimate flight but he was strongly pressed by both Kilchreest Moon and An Fearchan at the last. However the 100/30 chance found a bit extra for JJ Slevin on the run-in to beat An Fearchan by half a length, with Kilchreest Moon just a head back in third. McManus' racing manager Frank Berry said, "It wasn't the greatest of races but he jumped well and had a bit of experience. He handled the ground and he'll probably go to Dundalk now to try and win a flat race. "He has been a bit disappointing on the flat but he'll win one along the way." 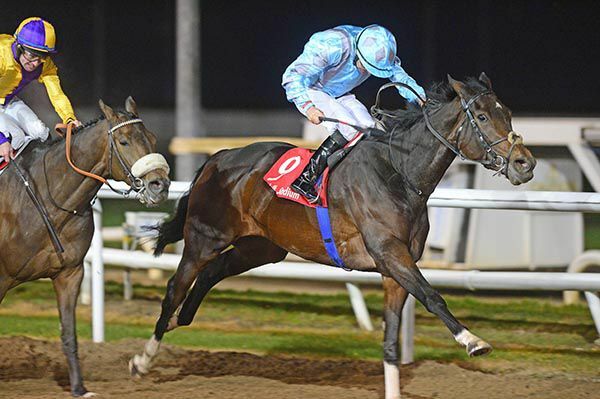 Shane Crosse had his claim reduced having partnered the second leg of a double at Dundalk this evening, as the newly crowned Champion Apprentice Jockey landed the Irishinjuredjockeys.com Handicap (div 1) on Too Precious for his employer Joseph O'Brien. Both individuals had earlier combined to win a maiden with Vhagar and Too Precious herself shed her maiden tag in style, when landing a gamble. The daughter of Holy Roman Emperor was an 18/1 chance this morning and having opened 11/1 on track, was returned an 8/1 chance before eventually beating runner-up Lady De Vesci by two and a half lengths. Trainer O'Brien supplied 13 of Crosse's 23 winners in this year's now concluded flat season and following today's latest success Crosse, steering his 30th winner, said “she disappointed us the last twice in handicaps but she had solid maiden form and had a good run here earlier this year so we knew she handled it. Stablemate Royal Court was the subject of a gamble and having opened up at 6/1 this morning, was returned the 2/1 favourite, ahead of 5/2 second-favourite Vhagar. In the race, Vhagar made most of the running to beat Royal Court by a length and a half. 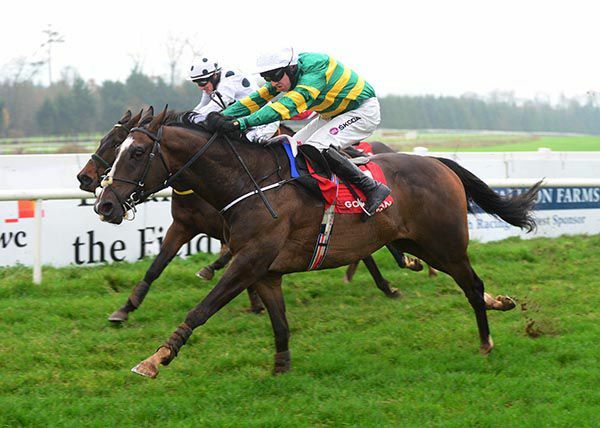 Afterwards Crosse crowned Champion Apprentice at Naas on Sunday, stated “I wanted to get to the front as he’s had a few runs now and been very consistent. The easiest way was to make the running on him, and to be fair he kept at it well. 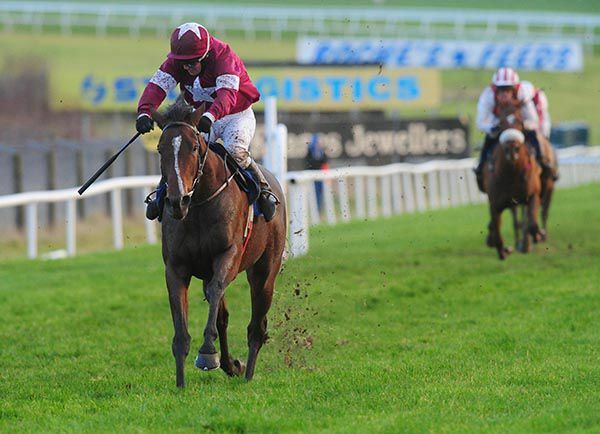 Sidelined for a lengthy spell after being injured at the Galway summer festival, J J Slevin rode his first winner since mid-July aboard his cousin Joseph O'Brien's Jack Dillinger (a half-brother to Bonny Kate and Mala Beach) in the Cashel Maiden Hurdle. The third winning odds-on favourite in succession at Clonmel, Slevin kept it simple from the front on the well-backed Jack Dillinger (evens to 8/11). On start two for the O'Brien yard, Jack Dillinger delivered comfortably by four and a half lengths from Deburrafield. "That's my first horse for Michael (O'Flynn, owner) and Stanley and also my first winner for them," said O'Brien. "JJ gave him a good ride as he anchored him in front and he's not the most straightforward horse in the world. It's also JJ's first winner since coming back so it's good for him too. "I think the horse will get some confidence from that as he has been to the well plenty of times. He'll have no problem jumping fences and handling slower ground. "They have done a great job with the ground here and it's very safe."